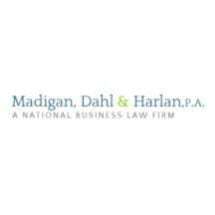 Madigan, Dahl & Harlan, P.A. is a closely knit group of attorneys, paralegals, and assistants dedicated to providing innovative solutions to issues facing the firm’s clients. The firm’s attorneys are known for their strategic thinking, innovative problem solving, and sound judgment. The firm is imbued with a hard working culture and a commitment to responsiveness and consistent attention to each client matter. The American Research Corporation and the Minnesota Journal of Law and Politics have recognized firm members as Minnesota’s "Super Lawyers." Firm members have been engaged to speak on numerous occasions on various legal topics, including speaking engagements before the National Beer Wholesalers Association at its annual meetings and national legislative conferences. Presented numerous seminars and been a featured speaker at CLE’s sponsored by the Center for Alcohol Policy. Engaged to speak on various legal topics by the State Beer Wholesalers Association from the following states: New York, Massachusetts, South Carolina, West Virginia, Michigan, Mississippi, Wisconsin and Minnesota. Presented at many Minnesota CLE’s on various legal topics. Firm members serve as volunteers on numerous civic organizations, including without limitation, the Metropolitan Airports Commission, the South Washington Watershed Board, and . . . Michael Madigan previously served 8 years on the Woodbury City Council and 3 years on the Woodbury Planning Commission. Firm members also serve on the Boards of numerous nonprofit organizations including AirSpace Minnesota . . . Michael Madigan previously served for 12 years on the Board of Director of the Minnesota Center for Environmental Advocacy and 3 years on the Board of the Sigurd Olson Environmental Institute. Firm members have donated hundreds of hours of pro bono service per year on behalf of nonprofit organizations and individuals in need. Michael Madigan has been an AV rated lawyer by Martindale Hubbell for over 20 years (the highest possible peer review rating in legal ability and ethical standards). Michael Madigan has been recognized as a "Super Lawyer" in Minnesota for over 13 years (a peer review rating given to only 4% of the lawyers). Michael Madigan has been inducted as a Fellow by Litigation Counsel of America (a trial lawyer honorary society composed of less than one-half of one percent of American lawyers). Michael Madigan has been recognized for his pro bono service to St. Paul citizens, 1996, St. Paul Neighborhood Hall of Fame, Hamline Midway Coalition Project. Michael Madigan has been recognized for his pro bono legal work regarding conservation for Minnesota's cold water resources, 1995, Silver Trout Award, Minnesota Trout Unlimited (TU Highest Honor).